Our for one of our regular walks near the house. No more sand between our toes or goats in the neighboring campsites because we have returned to our home in Maggie Valley. The S-RV trip was fun and we will try to work in another one or two before it gets too hot for us, but Hu-Dad had to get back to his busyness in his study. And so our walks are back on the roads or trails near our house. Of course, with Typhoon along, regular never means regular like normal dogs. He always has to add his unique touch to whatever we are doing which includes walking backward. We gave him bonus points for the tongue, too, but he says we are getting warmer even up here in the mountains. The walks can be quite tiring. Which might be why Hu-Dad takes us on them. Look, I can keep walking backward and change position. Sorry, have not been keeping up with the posts lately. Glad to see Winter ending and more moderate weather. Could use less pollen but the rains are helping to get it out of the air. 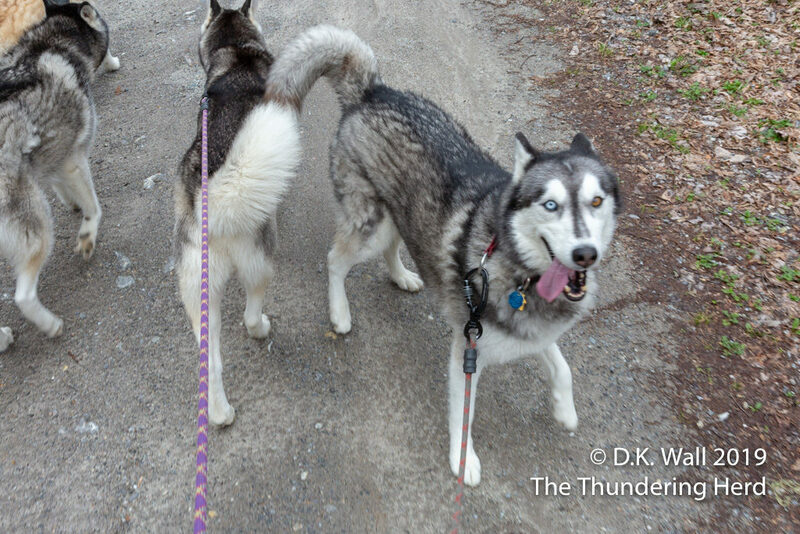 With great sadness I will inform you that Thor the piebald Siberian Husky I adopted earlier from Sarge’s in Nov 2018 is not working out behavior wise with some of my huskies. He wants to be the alpha male and my other males are not buying it. Talked with Heather at Sarge and will be working a return in the near future. He needs a situation with less competition for attention. Dave-sorry to hear about Thor but you are doing what’s best for him. It’s great to see the Herd back to their “normal” walks and silly Typhoon’s walking backwards!!!! Yes Dave, so sorry things aren’t working out with Thor. He’ll be happier in a home where he is king over his domain. Good to see the herd back to a “normal” routine! Thank you Jean and Lori for your support. 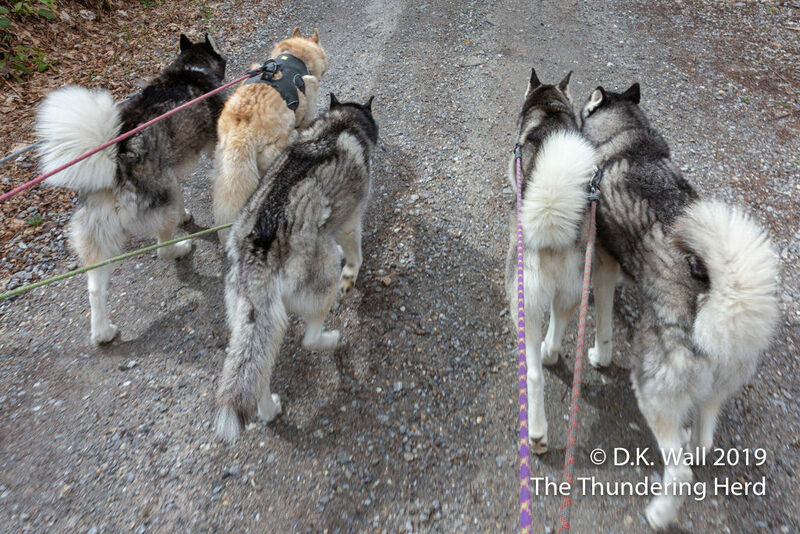 From day one Thor wanted to be in the “inner bed dog circle” King my 12 yr old Alaskan Malamute rescue from Mitchell County animal Rescue and Elsa my 4 year old female Alaskan Malamute rescue from SHAR said “no way” are you getting on this bed with Dad” But after several weeks of trying they relented and made some space for Thor. 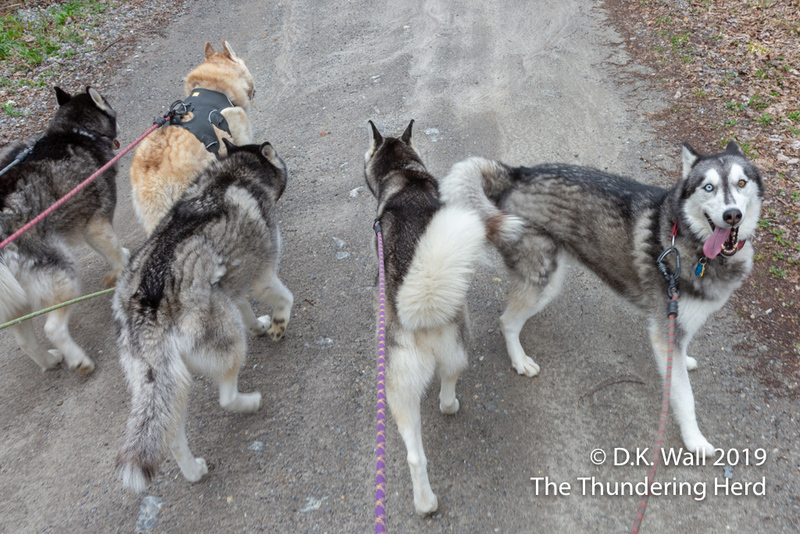 This last Winter we did have quite a few”Three Dog Nights” (love the 70’s band!). But as it gets warmer 3 dog nights could get uncomfortable! Thor is a real talker and moves his head around to make his point stronger. “No” and “paws off the counters” are not his favorite things he likes to hear. He will get a heartworm test next Monday to see if the last 5 months of heartworm meds had eliminated his positive test results he had 6 months ago. He is the faster runner here in the backyard and likes to be the chase “rabbit”. Enough for now, sorry Kirk for interrupting the “herd” flow. Thor reminds me of Archie Bunker of the “All in the Family” show back in the 70’s. Ha! Thanks again for reading, sorry Kirk! No apologies needed. As a family of rescues, we love doing whatever little thing we can to help a dog find its proper home. 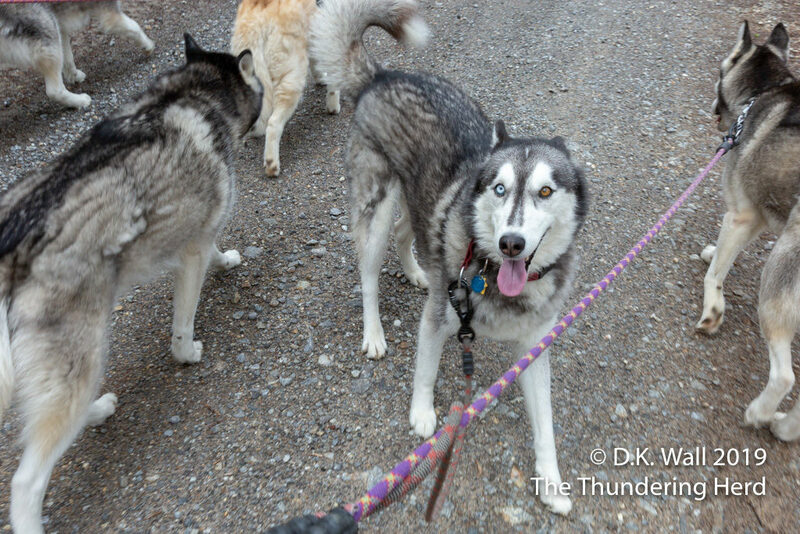 And, if anyone is interested, we have met Thor and know what a beautiful dog he is. Looks like a wonderful time. The weather here is finally starting to pick up and we are taking our little ones for longer walks now. Typhoon, you are just too cute. Walking backward is just your style. Thanks for sharing the lovely photos. Have a wonderful day.